Frontline Specialist Jamie Zihlke, has always loved birthdays. She sees it as that one day of the year where you get to feel extra special. “It’s your day,” she says. 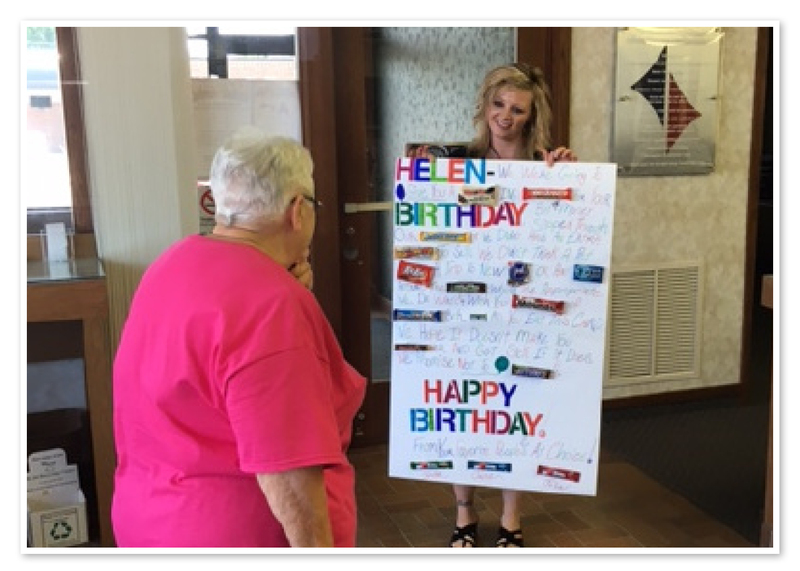 That’s why every month, she takes a look at the upcoming birthdays for her customers at Choice Financial in Comfrey. Recently, two birthdays caught Jamie’s eye that resulted in a particularly sweet surprise. Helen and Carol turned 76 and 77 this year, respectively. Both come in to Choice’s Comfrey office and have a character that lights up the room. Jamie, along with Frontline Specialist Jennifer Evers and Location Manager Julie Fredin, wanted to give these women a special birthday treat. Jamie took to Pinterest to browse for ideas, and stumbled upon a particularly clever project: The Candy Card. They decided it would be a perfect treat. Creating these cards was no simple task. 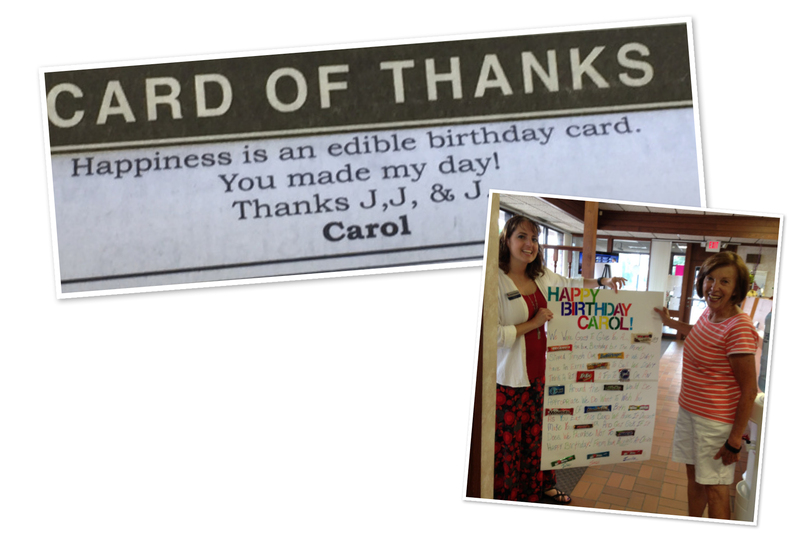 They needed huge poster board for the card, and specific types of candy bars to assemble the birthday message. On her own time, Jamie traveled to four different stores in the quest for the right candy bars. The 100 Grand bar and the Now N Laters were particularly elusive. “It took some time to make it right,” Jamie said. And they signed their names with Air Heads. The card was a huge hit when the women received it. Helen immediately walked across the street to show it off to her friends at Bingo — not allowing them to touch the candy bars, of course. Later, she told Jamie that after eating the candy, she carefully replaced each wrapper and had the card framed for her home. 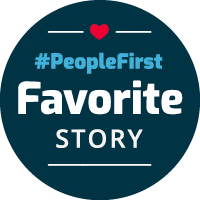 Julie and Jennifer sing Jamie’s praises when it comes to going above and beyond for their clients. Whether it’s arranging presents like candy cards, ordering hand cut flowers for a couple’s anniversary, or hand drawing birthday cards for others, she is consistently “going out of her way to make people feel special,” Julie said. As for birthdays to come?